Where farmers’ markets, farm stands and gardens bloom….our late summer go-to dishes are fresh, flavorful, healthful and, most importantly, easy to cook. Produce at peak flavor needs little manipulation. For tips on choosing produce, see “Pick of the Late Summer Crop”. Most of these dishes (corn being one exception) can be made in advance and served at room temperature. 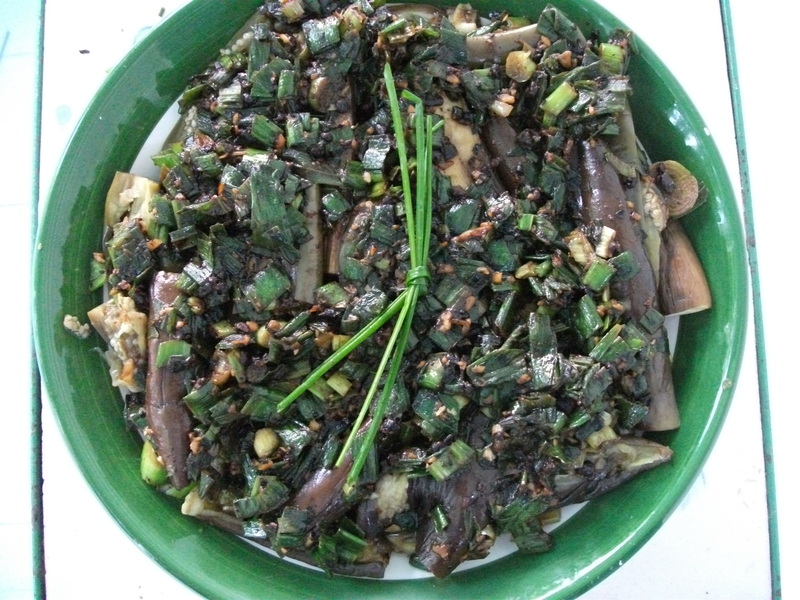 Eggplant has long been a staple in parts of the world where meat was used sparingly. Think Asia, the Mediterranean, the Middle East. With its firm, spongy flesh, eggplant adapts well to a variety of flavors and seasonings and has a satisfying meaty texture. It’s low-calorie, low carbohydrate, a good source of potassium and folate and contains B6 and magnesium. 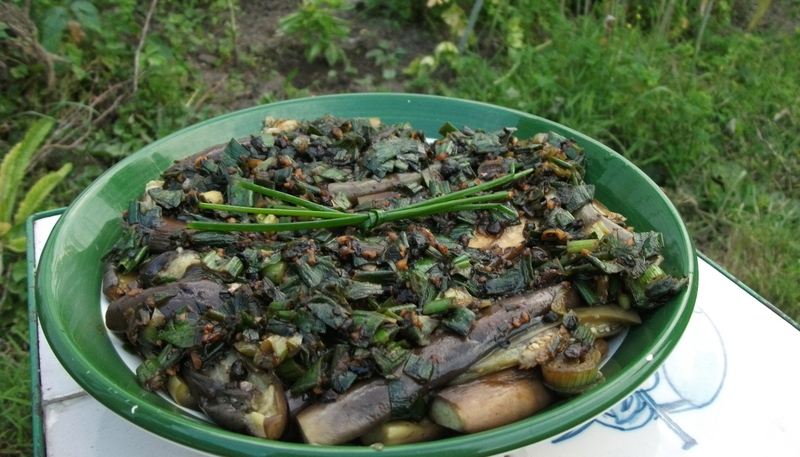 To prepare eggplant: Wash eggplant well. Trim and discard ends. Halve eggplant lengthwise. Arrange in a single layer in two glass pie plates. Sprinkle salt over eggplant halves to “sweat” out any bitterness. Let sit for 30 minutes. Then rinse eggplant. To steam the eggplant: Place a rack that fits in a flat-bottomed wok filled one-third of the way with water. Over medium-high heat, bring water to a boil. Place pie plate with eggplant on rack. Steam eggplant in covered wok over medium heat, about 20 minutes, or until eggplant is easily pierced with a knife. Transfer to another dish large enough to accommodate all the steamed eggplant, arranged in a single layer. Steam the remaining eggplant and transfer to dish when done. To make the sauce: In a small bowl, combine sugar, fermented black bean and water, blending well. In the same wok, or in a small saucepan, heat grapeseed oil until it is hot but not smoking. Add garlic and ginger, stirring until they begin to brown and stick to the pan. Add scallions, stirring about 1 minute. Add fermented black bean mixture. Blend well with scallions, garlic and ginger, stirring until mixture simmers and is heated through, another 1-2 minutes. Pour entire black bean mixture over eggplant. Tomatoes are high in vitamins C and A. And tomatoes famously contain lycopene, a carotenoid with antioxidant and cancer-fighting properties. Lycopene made health headlines for promoting prostate health, but research suggests it may have a protective effect against other cancers (including breast, endometrial, pancreatic and lung). If you eat tomatoes regularly, you’re also getting a good dose of fiber, potassium, niacin and B6, all good stuff that can help lower blood pressure, and, in turn, reduce your risk of heart disease and stroke. Heat olive oil in a large heavy-bottomed three-quart saucepan over medium heat, until hot, but not smoking. Add tomatoes (yes, I use the whole tomato, including skin and seeds). Stir well, about 2-3 minutes. Let tomatoes come to a roiling boil. Lower heat. Cover and let cook another 40 minutes, or until tomatoes have “melted”. If tomatoes are very juicy and have released a lot of liquid, uncover, raise heat and cook until most of liquid has evaporated and tomato sauce has thickened. Let cool. Pour mixture into a blender or food processor, pulsing until well pureed. Transfer sauce to a non-reactive bowl. When cool, store in an airtight container and refrigerate for up to a week. A low-calorie, fiber-rich and low-carb vegetable, zucchini is incredibly versatile, from quick breads to quick sautees, to oven-baked casseroles. Boasting Vitamins A and C, zucchini—green or yellow—is a good source of folate, magnesium, potassium and calcium. Zucchini also contains a nice dose of lutein and zeaxanthin, two carotenoids (phytochemicals that give certain fruits and vegetables their red, orange and yellow colors), which, when regularly consumed, have been linked to reduced risk for age-related macular degeneration that causes vision loss in people over the age of 55. 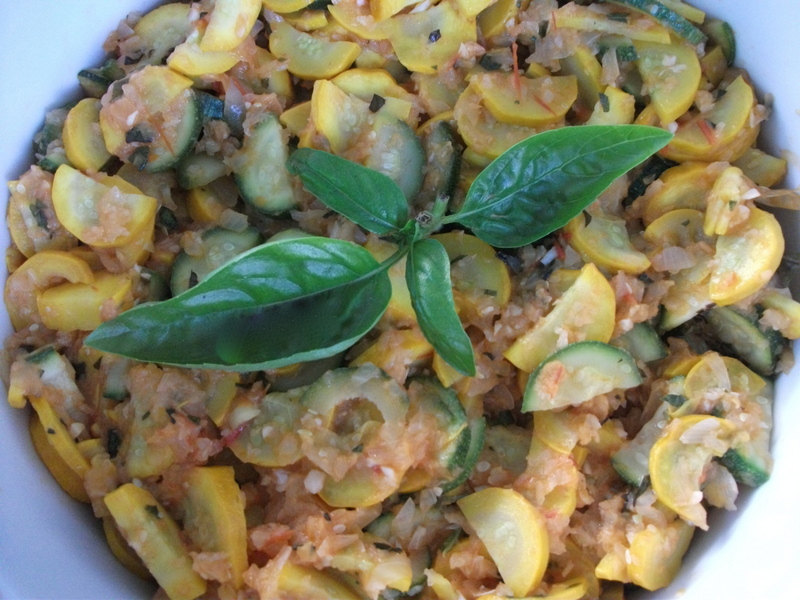 Below, you get a triple dose of carotenoids when you add tomatoes to summer squash. Heat olive oil in a Dutch oven over medium flame until hot, but not smoking. Add onions and saute over medium-low heat about 8 to 10 minutes, or until lightly browned. Raise heat slightly to medium. Add zucchini, stirring in until well blended, about 2-3 minutes. Add garlic, half the basil and lemon juice and combine well. Cover. Reduce heat to low and cook about 5 minutes. Stir in tomato sauce, cover, and cook another 5 minutes. Uncover and raise heat to medium. Add the remaining basil, freshly ground pepper and kosher or sea salt, to taste. Minus the fat—meaning, NOT doused in butter, cream or deep-fried in oil—potatoes are a good source of complex carbohydrates. They contain vitamin B6, iron, niacin, folate, magnesium and some protein. They’re a surprisingly good source of vitamin C. And did you know….potatoes are a high-potassium food, containing twice as much potassium as bananas?! Keep the skin on: it’s less work, adds texture and enhances dietary fiber intake (potato skins also contain various phytonutrients). One drawback: conventionally grown potatoes carry a high pesticide load—they’re on the Environmental Working Group’s “Dirty Dozen” list—so it’s best to buy organic. Or, the next best thing, buy them at your local farmers’ market. And always wash well. Wash potatoes well, and place whole, with their skin, in a large heavy-bottomed 3-quart (or larger) saucepan. Cover potatoes with cold water by 2 inches. Bring to a boil; then, lower heat and simmer, covered, 15 minutes, or until knife easily pierces through potatoes. Avoid overcooking, or the texture will be mealy. While the potatoes simmer, whisk sugar and apple cider vinegar together in a large non-reactive bowl until the sugar dissolves. Add shallots, mustard and olive oil, whisking until mustard vinaigrette is well combined. Transfer cooked potatoes to a colander and run under cold water. When cool enough to handle, slice potatoes (with skins on) into uniform quarters or sixths (depending on size of whole potatoes). Using a large spatula, fold potatoes into mustard vinaigrette until well blended. Sprinkle in tarragon. Season with kosher or sea salt and freshly ground black pepper, to taste. 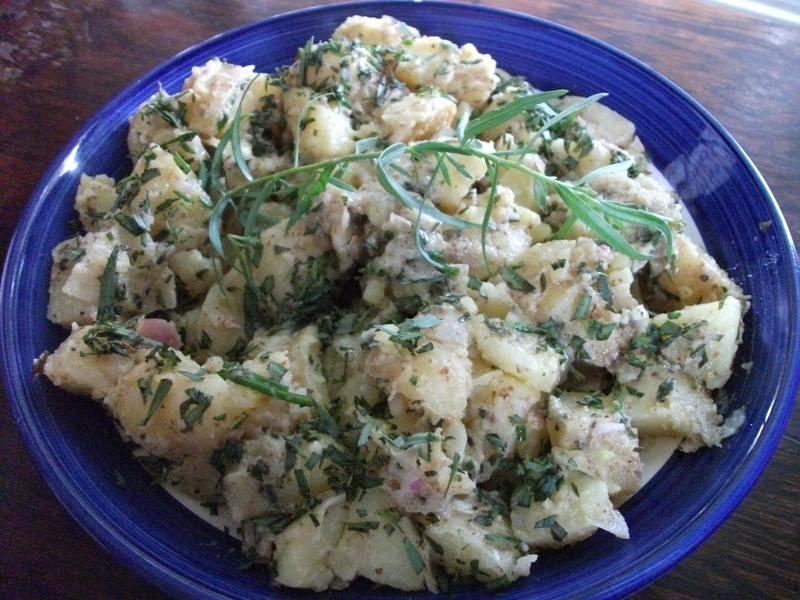 *Potato salad can be made 1-2 days in advance. There’s nothing like fresh corn in season. Pick a few good ears, cook with care, and you’ll get corn—even when eaten plain—that’s sweet and delicious. Eat in moderation though: corn is a high carbohydrate vegetable (about 25.1g carbohydrates per 3.5 oz fresh cooked corn). Its attributes? Corn is rich in dietary fiber and a great source of B vitamins, like folate, thiamine (B1), riboflavin (B2), niacin (B3) and pantothenic acid (B5). You also get zinc, magnesium, some vitamin C, and a nice dose of potassium. Cooking corn-on-the-cob seems like a deceptively easy task. But I can’t tell you how many times I’ve eaten corn-on-the-cob that’s been ruined by overcooking. 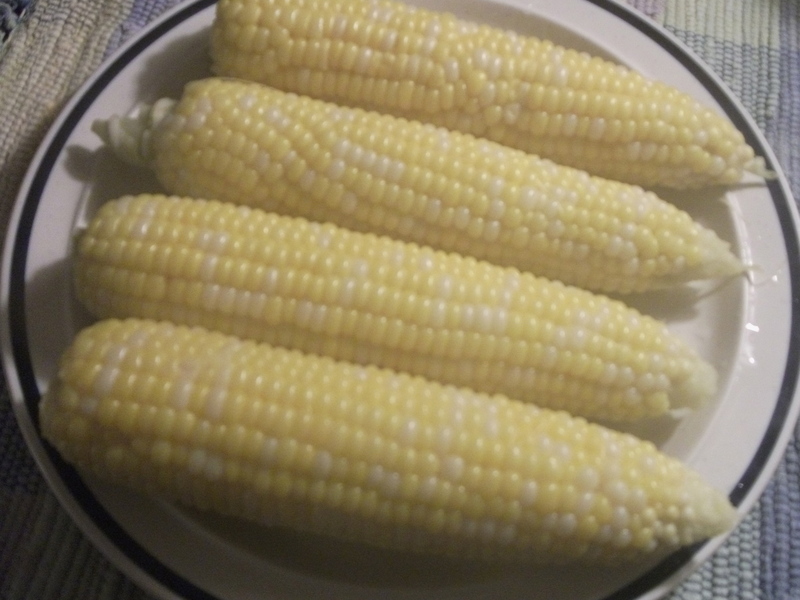 For the recipe: see Christopher’s post on how to cook corn….and getting it just right! This entry was posted in Food, Health, Home Cooking, Wellness and tagged fresh cooked corn, fresh tomato sauce, new potato salad, steamed Asian eggplant, Summer squash, zucchni. Bookmark the permalink.